The new housing minister said it would be published directly after the deadline, with work to commence in September. THE GOVERNMENT WILL miss its own 100-day deadline for the publication of its action plan for housing. 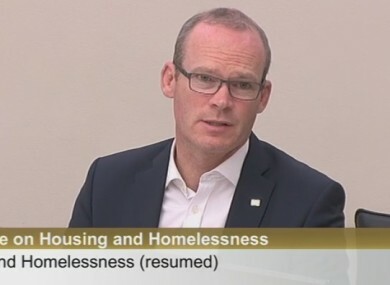 Housing Minister Simon Coveney was before the Housing and Homelessness Committee today, where he said the plan will be delayed due to the deadline falling in the middle of August, when people will be on holidays. One of the problems around the 100 day target is that it lands right in the middle of August. For obvious reasons, that poses a problem because many people are not focused on work in the middle of August. I suspect some of the people at this table will be, but many others will not be. He told the committee the plan would be published at the end of August. That is the likely timing at this stage. It will lead to it being launched immediately after the 100 days are up and then selling it. We could launch it at the end of July before everybody heads off on holidays but that is not the kind of momentum we want the project to generate. He said the “aggressive work programme” will begin in September. The minister said he was open to the State buying properties from banks. I would like to see the State buying up property… particularly vacant properties. Coveney said he would like to see the State roll out a purchase programme where it would look for “bargains”. He said some of these properties might not yet be on the market, but might be coming on stream. The preference is to acquire vacant units where possible. Coveney said he wanted to listen to all stakeholders and take on board the committee’s report and recommendations. We may not be able to take some of them on board and I have not seen all the recommendations, but my only objective is to get better outcomes in terms of house delivery and responding to people’s dire need for State assistance, whether they are homeless now, at risk of homelessness or on a social housing list, relying on the State to deliver for them. Coveney told the committee that just over 12,600 housing units were completed last year, almost half of which were individual or “one off houses”. Ireland needs to be building somewhere in the region of 25,000 units per annum to meet the need, he said. This was the target in the programme for government, but the minister said he hopes to exceed that target as soon as possible. The minister said he plans to exceed that target for the next five to ten years. The rapid-build programme will also be accelerated and expanded. Last year, the government approved the delivery of 500 units of rapid delivery housing for homeless households residing in commercial hotels across Dublin. An initial 22 units were delivered in Poppintree, Ballymun, and another 131 units are expected for completion on four sites in Dublin city between October and December this year. A mix of both private and social housing is the aim, however, Coveney said there can’t be situations where communities block social housing in their areas. Coveney said government would be increasing the pressure on An Bord Pleanala to speed up their decisions. However, he acknowledged if they want quicker answers on planning, the authority will need more resources to get the job done. Former Environment Minister, Alan Kelly previously told the committee the new housing minister would need a broader range of powers in areas of finance, expenditure and social protection. Coveney said the Cabinet Committee, which includes the Ministers for Finance, Public Expenditure and Social Protection and is chaired by the Taoiseach, is working on the issues on a weekly basis. The government knows we have to get housing right and it is for that reason that I personally sought out this portfolio. He acknowledged the housing crisis was an “emergency situation”. I want to assure this committee that for my part and that of the government’s, housing is our number one priority and must be, and will be, comprehensively tackled. Email “Coveney to miss 100-day housing plan deadline as 'people are not focused on work in August'”. Feedback on “Coveney to miss 100-day housing plan deadline as 'people are not focused on work in August'”.